Black Worcester is probably the oldest English pear still in use. It can be traced back to the early 16th century, and is probably much older than that. Black Worcester pre-dates the trend towards the Continental sweet buttery-fleshed pears that became popular in Victorian England. Instead the flesh remains hard, more like an apple, and is interspersed with gritty flecks. It sounds somewhat off-putting, but don't worry - this is not a pear you eat fresh, but rather one for the kitchen. Slow cooking transforms the fruits, and this is the definitive choice for traditional English stewed pears. Black Worcester is also quite widely known as the Warden pear, although this is probably an old English term used to describe any long-keeping culinary pear. Please fill in the details below and we will let you know when Black Worcester pear trees are back in stock. A French contemporary of Black Worcester, likely to have been served at the court of Louis XIV. Black Worcester is in flowering group 3. Black Worcester is a triploid variety and cannot pollinate other varieties. It needs to be pollinated by another tree of a different variety nearby. You can either plant a self-fertile variety (which will pollinate itself and the Black Worcester) or you can plant two pollination partners which must each be of different varieties and able to cross-pollinate each other as well as the Black Worcester. If you need further advice on this just get in touch. Since it flowers in the middle of the blossom season it can be pollinated by most other pear trees. 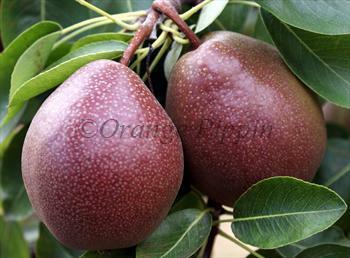 Like many ancient fruit varieties, Black Worcester is easy to grow and relatively untroubled by the usual pear diseases. Pick the pears in the middle / end of October, and store in a cold garage or fridge. Unlike more modern pears, they will readily keep for a couple of months. The origins of Black Worcester are not certain, but it was known in the early 16th century, and famously appears on the coat of arms of the city of Worcester.